Vegan Eats and Treats! : Two Days of Eating! 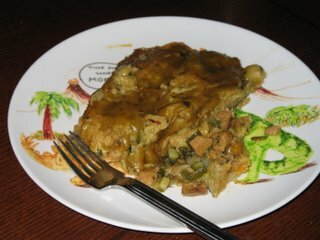 The day before yesterday, I made some green enchiladas. They were very delicious and very simple. I chopped up an onion, a couple of small zucchini, a bunch of chard, some homemade seitan, and a little bit of cooked butternut squash that I had in the fridge. I sauteed the onions and seitan together, then added the other veggies, and cooked a bit longer. Then I turned the oven on to 350, lightly oiled the baking dish, and poured 2 cans of green enchilada sauce into a small skillet. Bring the sauce to a simmer, and then turn it down. One by one, add a corn tortilla to the sauce until it softens. Carefully remove it and set it into your baking dish. Scoop up some filling and close up the tortilla (it's a good idea to flip it over so that it is "seam down"). Continue until you've made all your enchiladas (I made 10). Pour over the remaining sauce, and bake for about 45 min. YUM! I know it's not my best food pic ever, but I swear to you, these are very tasty. Last night, I made a version of the "Orecchiete with Cherry Tomatoes & Kalamata Tapenade" from VwaV. 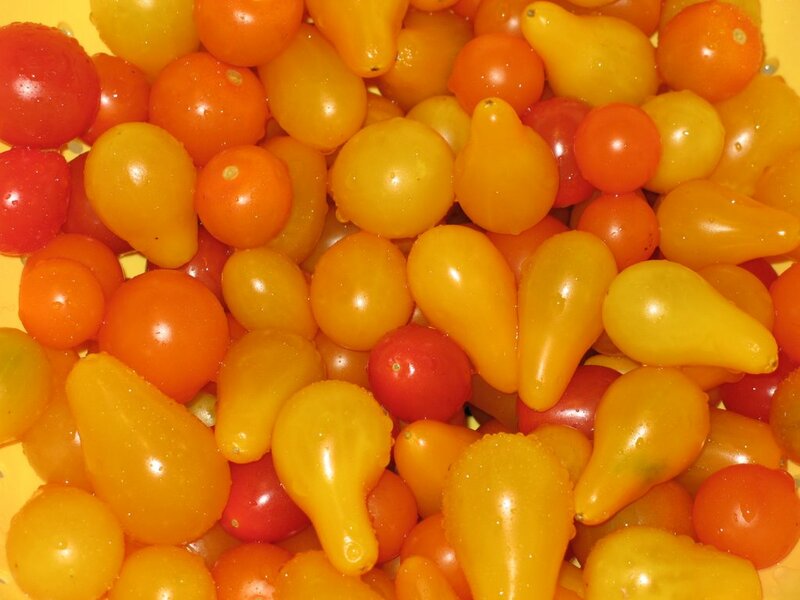 I used a big, beautiful bowl of yellow, orange, and red cherry tomatoes that I got at the farmer's market this weekend. 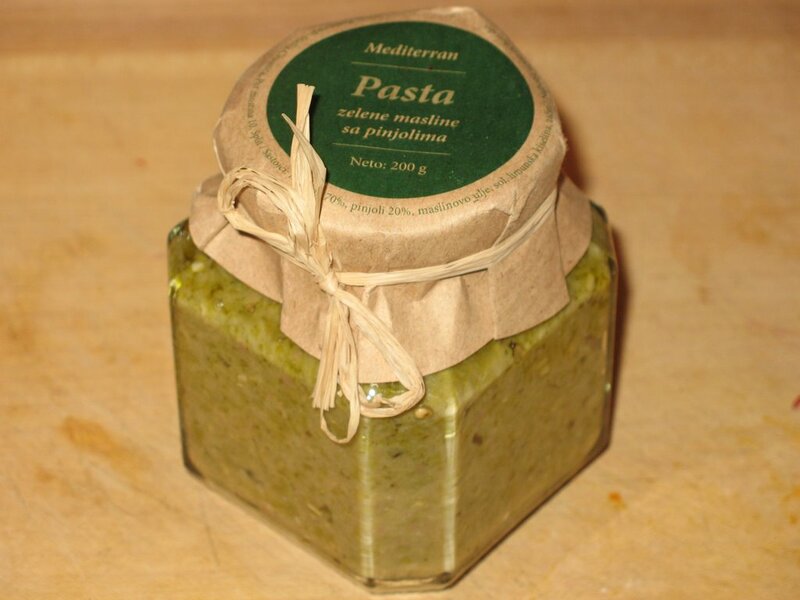 Instead of making my own tapenade, I used this wonderful olive spread that we bought on our trip to Croatia. It's make with green olives, garlic, pine nuts, spices, and olive oil. Yum Yum! It has such a lovely flavor. 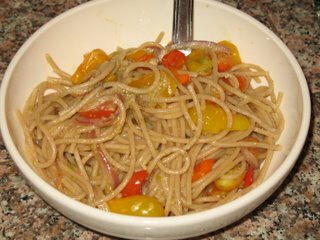 That pasta dish looks simple and flavorful- just my kind of pasta! The tomatoes are so gorgeous! I can't believe my garden is frozen over- whine whine! And that olive spread looks divine. The pasta dish is so colorful and healthy! Mmmm, olive tapinade?! :P :P Is that recipe in Vwav?? I must look again! I like your premade one though, it looks so fancy! :) Croatia?! Lucky you!! yes, this is one of my favorite recipes from VwaV. The only changes are that I use about 1/2 - 2/3 c of tapenade instead of one whole cup, and I saute the onions alone and only add the tomatoes at the very end (so they don't get smooshy). It's so quick and delish.